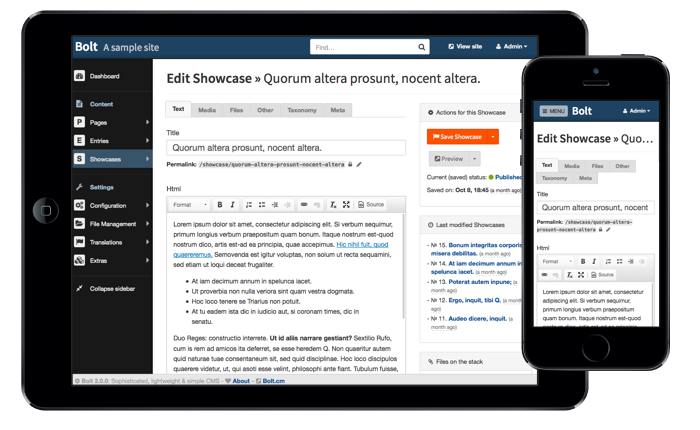 Bolt is a relatively young open source CMS software with a rapidly growing user base. Entering the CMS stage in 2012, it is utilizing modern open source libraries and has proved so far that it is an excellent tool for creating elegant HTML5 websites. It is lightweight and highly customable although lacking some of the functionalities that the larger CMS platforms provide. But for that Bolt compensates with an incredibly easy to use interface. Even editors who don’t have much previous experience with it can easily create new content. And content management is made even easier, with the latest release of Bolt you can easily edit content from the front end so that you can directly see how it will appear for the visitors. One of the main advantages of Bolt over other similar CMS scripts is that it’s highly flexible. Whether you are creating a small website, or you are laying the foundation for something big, Bolt has it all. And along with that the documentation provided by the development team is really well made. To help you get started with Bolt our Technical Support team provides Free Bolt Installation.